Cream Baby Face - a sensation of well-known Korean series "Unique BB creams - the skin was perfect!" Cream Baby Face or "skin like a baby" contains BB micropowder with nanoparticles that mimic the delicate skin of the child. Cream remarkably hides dark spots and skin roughness, wrinkles and age spots, to achieve smooth skin, like a child. BB Cream Baby Face cream like all the BB series, not just the usual foundation, it is anti-aging, nourishing and caring for skin cream, while having the masking properties of foundation. That there is a cream BB Mistine Baby Face - is both caring and decorative cosmetics. A distinctive feature of the cream Baby Face - this is even more delicate texture of cream, cream evens skin to perfection and gives the skin a glow of youth. Cream BB Mistine Baby Face is suitable for any skin type, oily skin cream is wonderful mattes and removes shine and oiliness. BB - cream also protects the skin during the day from the harmful effects of the environment, and has a sun protection factor of SPF 30 sun. The cream has a light tone. 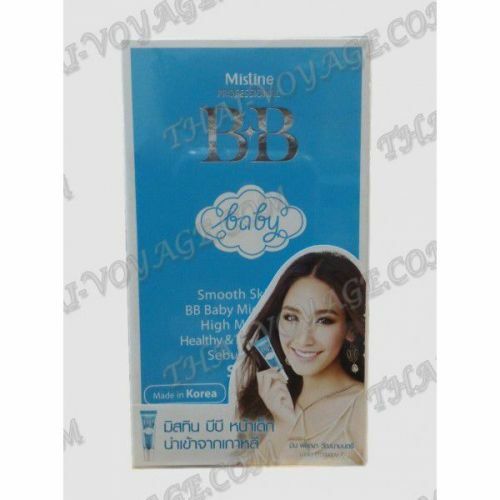 Application: The cream is recommended to use BB Baby Face every morning as a base under make-up. Apply BB cream should be a fingertip, for the whole person enough to be a small droplet cream BB Baby Face - cream has a dense texture and is easily distributed over the surface of the face and neck. The stunning result - a smooth, matte velvety skin like a child!